Wooden Indian is carved from one solid piece of wood. Made by skilled artisans, it is a lovely wooden indian furniture piece that will look great inside your home or at the entrance to your home, cabin, motel, hotel or store. Unlike the stereotypical wooden cigar store indian, this Plains Indian Chief does not hold a bundle of cigars (contact us if you're looking for this style). 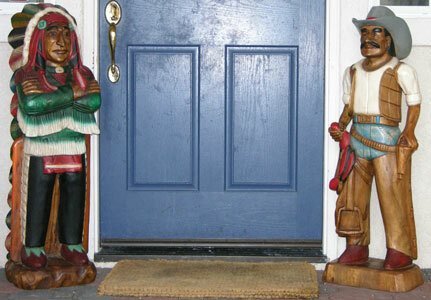 Since each wooden indian is individually handcrafted and painted by artists, variations may occur. Due to the fact that the wooden motel indian is carved from a single piece of wood, there may be some filled cracks in the word, but this adds to the character and Old West feel of the piece. 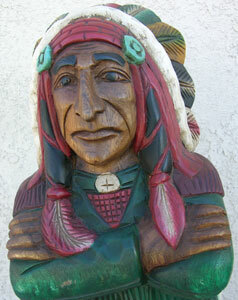 Wooden indian measures approximately 40 inches high and weighs about 50 pounds. 70 inch tall statue is also available. Shipped via FedEx or UPS Ground. Shipping charges vary, depending upon your location. We only charge you what it costs us to ship. We do not pad our shipping costs, like some companies. Reserve this stunning wooden indian today.